Hello everyone! I recently did a poll on twitter asking you all what you wanted to see on the blog. I have had the idea of doing monthly (or even weekly) college blogs discussing my week and experiences. 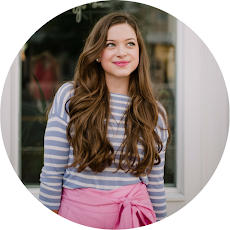 You all voted this for my new series on the blog, so I am very thrilled to begin this journey on the blog. I am basing it off of Dorothy's from Prep in Your Step (a Furman grad!!) "Step into My Week". 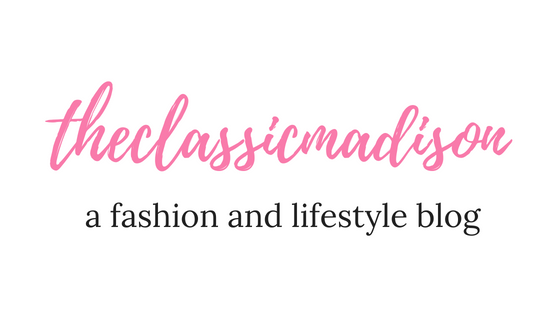 I am addicted to reading her weekly adventures, especially when she was in college, so I am so excited to share a similar style blog with you all. I decided to call it #classicmadison. I thought it would work for the topic, but if you have any other ideas for names more college related please feel free to let me know as I am not good at creating titles! Without further adieu, I want to share with you all my highlights from my first month (and about a week!) in college. Enjoy! So I won't go into the nitty gritty of every single thing I did considering I will be including about six weeks worth of stuff. 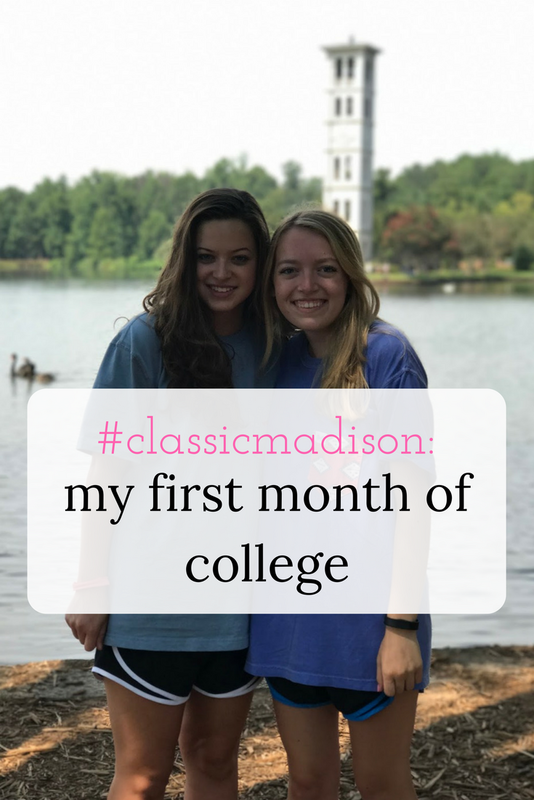 However, I do want to include personal experiences that can give you some insight to what your first month of college will be like. I'll sprinkle that in every so often. The first week was a whirlwind of moving in, orientation, and starting classes. I was absolutely exhausted and honestly I was most stressed the first few weeks of school than I am now. Move-in day was hands down one of the most exhausting days of my life. 90 degree and humid weather mixed in with heavy objects and lots of walking made the day excruciatingly long. I also didn't eat lunch (not a good idea), so it made the process much more stressful than it needed to be. However, I did enjoy organizing my new life and starting me new adventure. I wanted to include a semi before (as in the rug some items are already in!) and an after photo. You can see my dorm tour here. Orientation at Furman is kinda crazy, as I'm sure it is at any college. From what I remember, the very first day (after 6 hours of moving-in!) I attended a welcome session, met my advisor, had a family farewell, attended some orientation group sessions, and went to Target for last minute dorm essentials. Move in day seems like forever ago so I sadly can't recall many details of the day! A few days into the blur of orientation (I'm really sorry I can't tell you all the details- I honestly can't remember because we were so busy! ), Furman was in the path of totality for the total eclipse. It was such a cool experience and I knew it deserved a bit of attention in this post. I watched the eclipse in front of the Furman lake, and as soon as the eclipse occurred, the lights on the Bell Tower turned on and it looked completely dark out. Such a bizarre but transcendent experience that I will never forget. Then classes started! This semester, I am taking French 201, Bible and Ultimate Meaning, Bio 111, and a writing seminar on psychology in literature. At Furman we have GERs, which are general education courses that go towards your degree. I am trying to knock out a couple of those GERs at the moment, hence French and Bible. If you didn't know, I am planning on majoring in Psychology, so my writing seminar is really interesting to me and I feel like it can help towards my major even though it is not a major specific course. Per Furman tradition, the student activities board put on a swing dancing night at a nearby park the first Friday of the school year. One of my goals this year is to learn how to swing dance because I obviously need some help in that department. 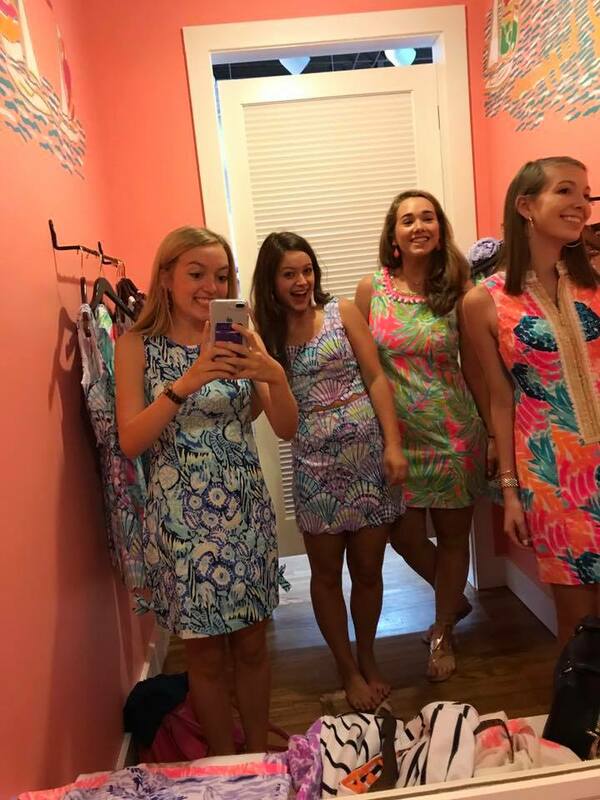 These weeks all seem to blur together now but I do remember going to the Lilly store downtown and shopping the After Party Sale with my roommate and some friends. I also attended a Greek function this week called "Meet the Greeks" where PNM can meet the different sororities and start to meet the sisters. Furman has delayed recruitment in the spring, so it has been really rewarding to meet the girls from all sororities ahead of time before starting to rush. I have already made some great friends with upperclassmen sorority members. At this point I started to notice that a little of the infamous freshmen 15 was starting to happen. It's inevitable, especially when your dining hall has some killer chocolate chip cookies. I've really been enjoying working out in the gym, and I try to go at least 4 times a week. I also joined the swim club so I go swim once a week as my class schedule conflicts with the other practice times. This weekend I got to go home for Labor Day Weekend, and my new found BFF, Abby Grace got to join along. Back in Tennessee, I took a 3 hour nap, gained about 10 pounds from eating at my favorite hometown restaurants, and took AG to the Great Smoky Mountains. It was a restful weekend spent with family, a new friend, and my oh-so-missed cat, Stinky. Sleeping in my own bed with my cat was the icing on the cake, as I literally miss cats so much being here. This week I attended a sorority info session for recruitment, had my first round of quizzes, and had a fun-filled weekend. I also think this week was the week I got into Furman Futures, a program where freshman host prospective students for lunches and overnight visits. Friday night, a group of friends and I ventured to try the Mexican restaurant right beside the campus, and yum! I miss queso so much and this evening was just divine. Tailgating was super fun as well. Since we haven't joined sororities yet, we are still confused freshman with no clue where to go, but we found some upperclassmen we knew who introduced us to others. I didn't eat any food because all the frats were cooking burgers and I do not know anyone in frat (shy freshman right here!). The game was interesting- I come from high school that lives and breathes football, so if a freshman sat in the front row of the student section they would probably be beaten up right in the student section (yes it was intense!). Football is not very big at Furman, but I still wanted to cheer on my team. We were almost in the front row (as freshman- I know!) We lost the game, but I it was still a fun experience as it was the first football game of my college experience. This Sunday, I got to go to church with a couple sophomores and some of my freshman friends. This is one of my top favorite memories so far, as I enjoyed the company of such amazing people. I loved the church I attended and I am planning to attend that church from now on. This week hurricane Irma hit Furman's campus and classes were canceled for me some days. This week wasn't too bad but the weather was a bit strange for September in South Carolina. I bonded with even more people on my hall and people from my classes. I feel like I am starting to get connected with people and plugged into campus which is something that is hard to do in the first couple of months. This week was the "midterm" week for me. Right now, every class is having the first round of exams. I had a biology exam, a French quiz, a paper due, and a religion exam. It was stressful, but my hard work was rewarded with an A+ on my bio exam, a B on my religion exam, and good grades on my other assignments. I also realized this week the importance of good friendships. I have started to make close-knit friends that I know I will continue to bond with over the next four years. It is so important to find some friends to hold on to in this brand new adventure. I also explored a bit downtown and got to see the waterfalls in Downtown Greenville. This week, I joined a bible study through College Young Life which I am looking forward to attending each Sunday. I also got closer with some girls from Young Life, as we are attending a YL camp this weekend! On Tuesday, I went to swim practice and got to know one of the coaches (who is a sophomore) a bit better at team dinner. It's super important to find friends in upperclassmen! This week also brought more sorority "pop in" functions and several CLP (cultural life programs- we have to attend 32 of these to graduate!). I attended a poetry CLP and a CLP on neuroscience, which I enjoyed because of my interest in neuroscience and psychology. About halfway through the week I decided I needed to add a bit more color to my room, so I added a mini "gallery" wall next to my bedside table, ordered a monogram M for above my bed, ordered some pillows, and hung up tassel garland. I'll show pictures in an upcoming post. I just needed to add some color because I felt like I had too much white space in the room! I hope you all enjoyed my first month (and a half) of college! 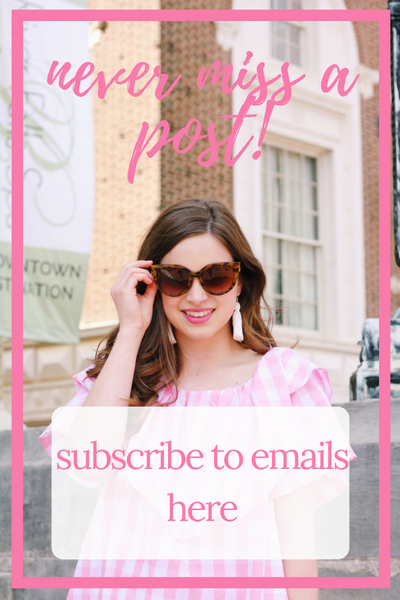 The upcoming posts in this series will probably be a span of 1-2 weeks, so I am positive that they will include more detail than this post did as I was frantically pulling events from my planner and remembering little things! Please let me know if you would like to continue seeing these. Until next time, I hope you are having a great school year. If you are applying to colleges this year, be sure to check out my post about college applications and college tours. Great to know that you had a great blast with your friends, especially when you’re far away from home into the dorms. It was very fun to read your https://topamericanwriters.com/ukessays-com-review/ and write a little message for you. May you successfully get all the good things in life. Remember to be kind!